Ever wonder what it felt like to lead a pack of Husky through the Alaskan bush? Well, here’s your chance to get a taste of the north! Indeed, the snow has just fallen over the reels of Alaskan Husky video slot. And the northern lights are creating a breathtaking show on the back of the reels that you won’t want to miss! Let yourself be guided by Husky through the dense Alaskan forest and embark on a Wild Ride! In particular, be on the lookout for the Red Husky since he brings with him a sizable jackpot of 100,000 coins! Keen to know more about this game? Then read what’s next! 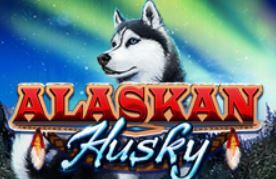 How to trigger the bonus features of Alaskan Husky video slot? The main feature of Alaskan Husky is the Jackpot. But, know that it’s not a progressive jackpot like the one you’d find in Biker Pigs per example. In fact, the jackpot, in this case, refers to the max win if you play on Max Bet. Meaning if you play $250 a spin. Granted that a bet this size is not accessible to everyone. Anyhow, know that if you place smaller bets, you can still win 500 coins when hitting a 5 of-a-kind red husky on the second payline. Moreover, we’ve briefly mentioned above that Alaskan Husky can take you on a Wild ride. In fact, know that this game offers both standard Wild Symbols, Random Wilds and Expanding Wild Symbols. In short any Wild that lands on reel 2, 3 and 4 will always expand in both the Free rounds bonus and in the base game. Now, to activate the 10 Free spins, you’ll need to get 3 Scatters on reel 2, 3 and 4. Of course, the Free Spins can be re-triggered during the bonus round, and the bonus is played on more paylines. For additional information on that, you should check the paytable. Why should you play Alaskan Husky? All and all, Alaskan Husky video slot is a true American classic. It’s one of those games that some may consider classic because of its look and feel. However, know that the features of this slot are overall pretty advance. Especially when compared with other traditional slots. Indeed, the various Wild symbols make for an engaging gameplay, because they have a good hit frequency. But before you play this game make sure to familiarise yourself with the paytable since the max coin win varies on the size of your wagers. Try it out at Tropicana Casino. Good luck and let the Huskies lead your way to Alaska’s riches.